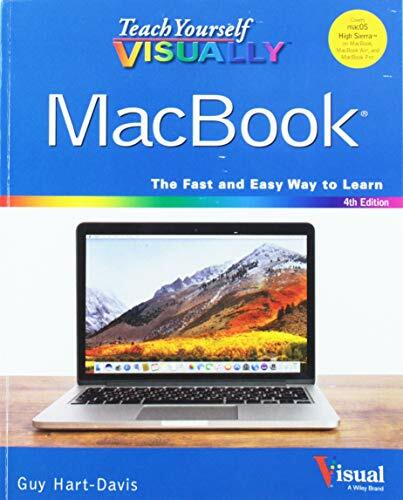 The visual learner s ultimate guide to the MacBook and macOS High Sierra Teach Yourself VISUALLY MacBook is your ultimate guide to getting up and running quickly with your new MacBook, MacBook Pro, or MacBook Air! Whether you re new to computers or transitioning from a PC, this graphics-heavy guide will show you everything you need to know to get the most out of your new laptop. Clear, step-by-step instructions walk you through each task, with screenshots that help you follow along with confidence. You ll learn how to manage files, work with macOS software, organize photos and media, set up email, access the internet, and adjust settings and preferences to make your MacBook work the way you work., You ll also explore the features that bring computing to a whole new level, including iCloud, FaceTime, the App Store, and so much more! The Mac has long inspired a legion of loyal fans, and you re about to find out why. From sleek design to intuitive interface, to an OS that just works, Apple has cornered the market on the high-end computing experience. The MacBook makes sublime computing portable, and this book shows you how to take advantage of all that your MacBook has to offer., Get acquainted with the latest macOS version and its new featuresPerform everyday tasks quickly and easilyCustomize preferences and settings to suit your needsDownload new apps, video chat, save to the cloud, and much more! No confusing tech-speak, no vague instructions, and no complex tangents into obscure tasks. This friendly guide is packed with screenshots, easy-to-follow instructions, and a practical sensibility; you re not launching the space shuttle, you just want to open your email. If you re ready to explore all that your MacBook can do, Teach Yourself VISUALLY MacBook is your ideal companion.